Died: 21st March 1917; age 21; KiA. Date of Entry Therein: 30th May 1915 – France. 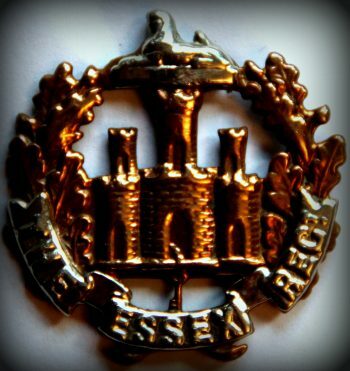 Regiment: Essex Regiment, ‘D’ Coy, 9th Battalion. Relatives Notified & Address: Son of George & Emma Clarke, of 4, Jarrah Cottages, Purfleet, Essex. George was 5 years old and living with his parents & siblings. George Clarke, 34, a Labourer – Oil Works, born Steeple, Essex. Emma Matilda Clarke (nee Rollingson), 27, born Canewdon, Essex. Lilian Maud Clarke, 7, born North Benfleet, Essex. Charles Alfred Clarke, 3, born Purfleet. 1911 4, Jarrah Cottages, Purfleet, Essex. George was 15 years old, a Sawyer’s Apprentice. He was living with his parents & siblings. George, 44, a Saw Mill Labourer – Tinker’s Yard. Frederick Clarke, 10, born Purfleet. Dorothy Clarke, 8, born Purfleet. John Edward Clarke, 6, born Purfleet. Edward Alfred Clarke, 4, born Purfleet. 1 Pings/Trackbacks for "GEORGE WILLIAM CLARKE"